An ILS runway 06L approach was performed. After touchdown, the flight crew was unable to stop the airplane on the runway. The airplane continued beyond the departure end, on extended runway centerline, and struck the ILS runway 06L localizer antenna. It came to rest with the nose about 600 feet beyond the departure end of the runway. The nose landing gear had collapsed rearward and deformed the forward pressure bulkhead. PROBABLE CAUSE: "The captain's failure to attain a proper touchdown on runway, and his subsequent failure to perform a go-around, both of which resulted in a runway overrun. 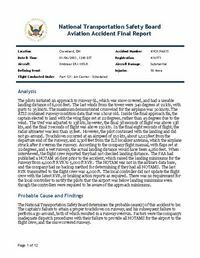 Factors were the company's inadequate dispatch procedures with their failure to provide all NOTAMS for the airport to the flight crew, and the snow covered runway." Distance from Windsor Locks-Bradley International Airport, CT to Cleveland-Hopkins International Airport, OH as the crow flies is 758 km (474 miles).